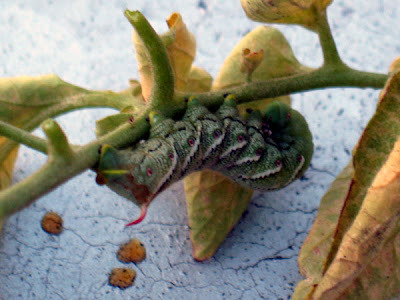 After a few days searching I found the hornworm caterpillar that's been eating my tomato plant, please please be the only one. Nasty, that thing looks huge! How are you going to get rid of it? I was too chicken to actually touch the bug, even with gloved hands, so I just cut off the branch it was on and dunked the whole thing into a bucket of soapy water.